Jia Aili is a graduate of the oil painting department of Lu Xun Academy of Fine Art in Shenyang—a city in China’s north-eastern province, Liaoning—and a recent graduate too—2006—which means he is a young artist. First impressions suggest a self-effacing, bashful even, nature. He is disinclined to talk, and until a discussant wins his confidence, the gloss of polite diffidence is hard to penetrate. But when a breakthrough occurs, his mind is revealed to be as active as the air in his paintings is still, which initially makes the artists rather hard to reconcile with his art. But not for long. Whilst most artists would probably consider themselves conscientious in their approach to creating art, Jia Aili is acutely so. His devotion is disarming in this contemporary age of ‘smart concepts’ and social punchlines given pseudo-aesthetic form, for it feels like a throwback to a now-foreign era, that of the Moderns, when, as inferred by the West’s largely romanticised version of art history, art was all about personal passions and emotional struggle, and, for those genius’ amongst the broader melée, a life condemned to being misunderstood, mocked, outcast even, and certainly not lauded as the art celebrities of today. 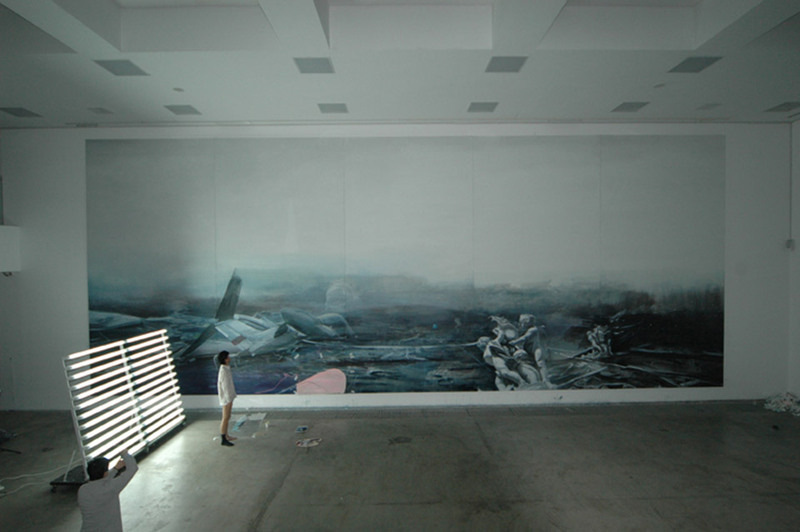 Jia Aili is thus something of a conundrum; making art very much of the present in terms of its sensibilities and the issues he seeks to tackle, and yet often, it seems, by means that are overly familiar in terms of how oil paint is brought to canvas, and how the compositions are structured. with the aura of the landmass. One might presume this to be driven by the energy of youthful aspirations, as well as a pure regard for idealism that is the privilege of the young. In the context of his work, in particular the series of paintings he has created for this, his first solo exhibition, we might admonish Jia Aili to worry less, for has clearly already found a style and a sensibility that have set him on the right path. Instinctively he knows this, yet fear of complacency will not let him admit it. Perversely then, he is discomfited by the natural sensation of pleasure that accompanies such early achievements. This brings us back to this artist’s perennial sense of struggle. It is not, however, in vain: he craftily presses the torturous, consuming emotions that monopolise him into the service of his art. In short, he turned depression to his literary advantage, and, to give a more example, British comedy writer, and self-professed manic-dipressive, Stephen Fry transforms black moods into a rich, dark humour. Shenyang where he lives experienced massive layoffs amoongst its workforce from the late 1980s thriugh the 1990s as the cors of local steel plants and heavy industry factories closed. This had a devastatiing effect upon the local economy. It is thus astonishing today to find parts of its centre to be almost unrecognisable, not least with the addition of shop signs for luxury European brands. Far from delighting in this phenomenon, Jia Aili finds the pace of change, and the speed of daily life it is thus astonishing today to find parts of its entre to be alluring; too gritty to be thrilling. Naturally, daily life challenges this position every single day, enen for this introvert who spends most of his time locked away in his studio. 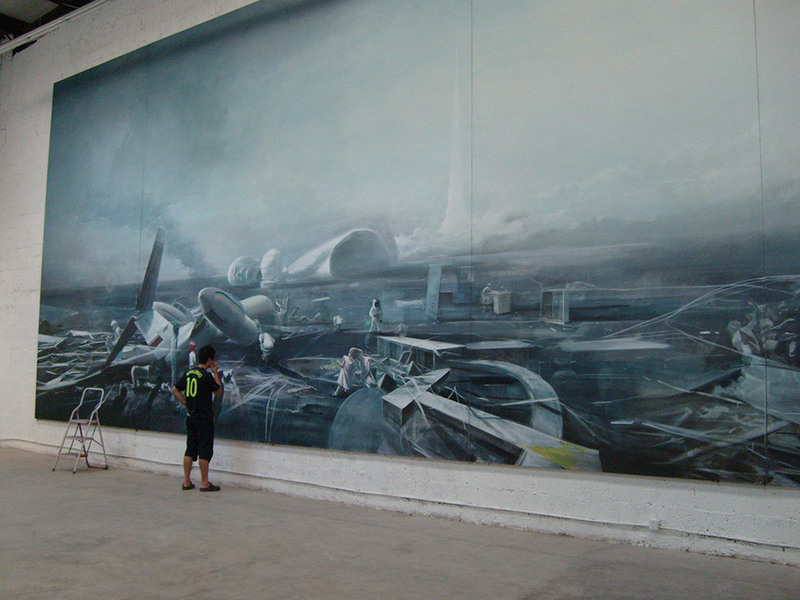 Hence the sense of stuggle, and the reason why one can say that Jia Aili’s his studio. Hence the sense of struggle, and the reason why one can say that Jia Aili’s chosen content rather chooses itself, as he labours to achieve balance in a world in turmoil that, in turn, makes turmoil of the self. Whilst personal experience feeds his work, Jia Aili’s approach to making art is not about usiing paint to retell a real life event, or to teconstruct a dramatic incident he has experienced: no to recreate the specific circumstances of a personal situation for the benefit of the audience. Instead, through the paintings, he posits a scenario that is best described as narrating the intimate nuances of a prinate mood, and one which he believes should be intelligible to all people. Jia Aili wants viewers to feel the anguish and isolation that engulfs his painted world: at least to step out or their worlds for a moment and experience his. This desire accounts for the enormous scale deemed necessary for the paintings, which ultimately draws viewers close to the solitary soul that Jia Aili inserts in the vast landmasses that set the stage for his synoptic psychological dramas. His art, then, is about a human condition, which is why the images or scenes depicted are not specific to China, nor especkally to the era, although the changing nature of daily life in China, and individual experience in this rapidly modernising society acts as a backdrop to Jia Aili’s awareness of human frailty, vulnerability, and the need to be mindful of one’s surroundings. It is being alert to his own environment that makes Jia Aili by inclination a loner, something he has in common with many artsts from the Northeast. Many srtists from Shenyang speak of the cold ambience of the social landscape, and the tensions of living amongst people characterised as brut, blunt, and tough. Social interaction tends to be minimal outside of tight-knit family units or bands of close friends. As referenced, Jia Aili’s preferrde scale for presenting his visions habitually approaches the monumental, and usually requires several large panels to satisry his needs, making a single painting five, six, or even more metres in width. These dimensions necessarily extend the time and effort required to complete each individual composition. During these protracted periods of time, the artist’s meditative activities do not default to pause mode – though at times he wishes it were possible to do so-no matter how intensely he is absorbed in the act of painting, or the emotion he wishes to imbue it with. This is apt to engender another type of obstacle to completing the work-mental, as well as physical exhaustion. Many painting get worked fifty percent and then are left abandoned. But it is not the amount of labour involved, nor a lack of stamina, which is the cause. Jia Aili explains that once an idea is developed and becomes fully formed in his mind, the act of painting is often, inevitably, teduced to a process of illustrating the thought, even though he wills it to be otherwise. In the early stages of giving form to an emotional impulse or state, Jia Aili frequently maps out the moods on paper iin broad strokes and roughed in patches of colour-usually contrasthing tones of a single or extremely limited variation of hue. The resulting sketches are a visual abstract of the big idea? And created on impulse with the freedoom of knowing that the gesture is of little enduring significance, they often evolve into extraordinarily succinct and powerful examples of the attmosphere and emotional states Jia Ail seeks to express. The great expanse of the major canvases denies such directness, in addition to which Jia Aili’s penchant for detail is apt overwhelm his mental state, because it shifts the focus to individual forms,textures, and the balance and contrast between tones and colour. This focus then becomes an unintended distraction. The result is that, at best, Jia Aili finds himself losing concentration, whilst at worst,he feels his interest in a composition drain away, at which point the painting is usually abandoned until the inpulse or mood returus. There are times when the work goes faster, and this is reflected in the final paintings. At others, Jia Aili can spend weeks, months even, on individual compositions, and not necessarily just the large ones, that utterly frustrate him withtheir progress. The minute nuances involved in the placing of a figure, the cetails of a posture, even the exact position of a limb, can drive him to distraction. His desire is to transcend the pictorial mechanisms of straightforward, conventional reality, to portray landscapes of the mind, with just enough of a surreal ambience to jog the viewing habits of his audience off their accustomed track, forcing them to journey along a new, unfamiliar path. In one sense, Jia Aili’s approach to oil painting references one element of Chinese ink painting (also refrred to with the more current term Chinese brush painting), for here, one finds a whole-hearted emphasis upon the emotional state of the artist embarking upon a paiting, but with the accent on years of careful cultivation of the mind and spirit so as to contorol it, not to be controlled by it as Jia Aili allows himself to be. His early training further alerted Jia Ail to the special attributes of Chinese(eastern) aestheic values: especial nuances that gained particular emphasis when he enrolled as a student in the very(western) realism-rooted oil painting department at Lu Xun Academy, for thy were so clearly at odds with those applied in the West. More perplexing still, that today, these once-vevered values are almost entirely absent from the contemporary social consciousness. When we turn back to look at Jia Ail’s paintings, it is clear that the concept of emotion he brings to his art and invokes in the paintings has little to do with the emmotion associated with ink painting. © 2019 dslcollection All Rights Reserved. Registrer for news. Enter your email address and name below to be the first to know.